Aside from the famous La Tomatina Festival or the Tomato Battle of Spain, Europe has another famous and unique battle festival in the northern part of Italy – The Battle of Orange. 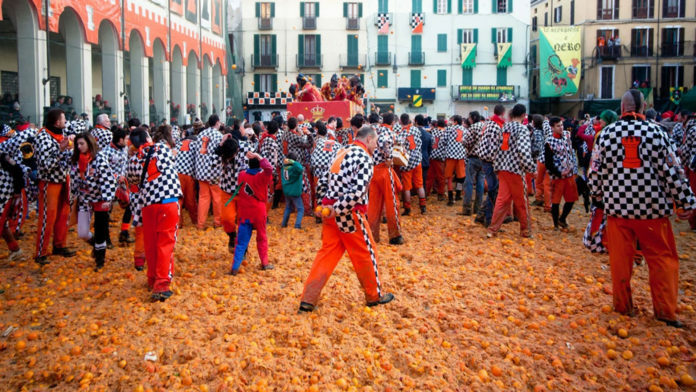 According to Storico Carnevale Di Ivea, The Battle of the Oranges is an historical depiction when the town rebelled against the tyrants in the Roman town of Ivrea. Scheduled in the month of February or March, the people of Ivrea gather and formulate nine tribes representing the tribes that revolted. Regardless of criticism for being dangerous, people are dedicated and determined with having the festival, they even created their own armors. The people of the nine tribes will fight in three days where each tribe has a designated location established within the city. The tribes will try to “kill” other teams by throwing oranges at each other. After the celebration, one tribe shall live. This festival has always been a fun and exciting experience for tourists and locals. So why don’t you join the battle as well?